Get affordable Security Camera installation on Los Angeles, CA and CCTV equipment with commercial quality and 2 years warranty. Security is important to everybody to ensure the overall safety and possessions. Protection4less offer Commercial and residential security cameras to provide homeowners and companies with adequate protection. We can install our high definition security camera systems on any kind of facility like: warehouse, office, homes, gas stations, schools, etc. Our security camera systems are really easy to use: they use friendly software. For the customers is easy to learn how to manage our security camera systems: video playback, video export and user management, are some of the most important task to do, and can be done in seconds. We have high definition 1080p, PTZ security cameras. PTZ cameras make it possible to monitor different areas. PTZ cameras can zoom, tilt and rotate. Can be controlled directly in the DVR monitor, or remotely through smart phone app. PTZ cameras quickly move and focus on different objects in the scene. The optical zoom feature provides the ability to retrieve details like faces or license plates. This camera is ideal for large parking lots where you want to follow people, or vehicles. 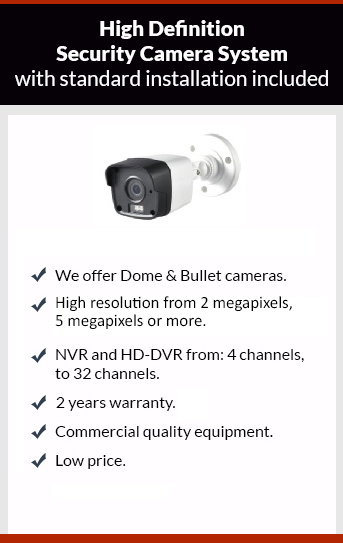 If you want the best high definition security PTZ camera just give us a call. The estimates are free.